This panel was in the collection of Baron Heinrich Freiherr von Tucher, where it was recorded in 1908. The collection of this German diplomat stationed in Rome was auctioned in Berlin in 1927. Between this date and its entry into the Thyssen- Bornemisza collection in 1929 the panel was restored and transferred, together with its preparatory ground, from its original panel to the present one. 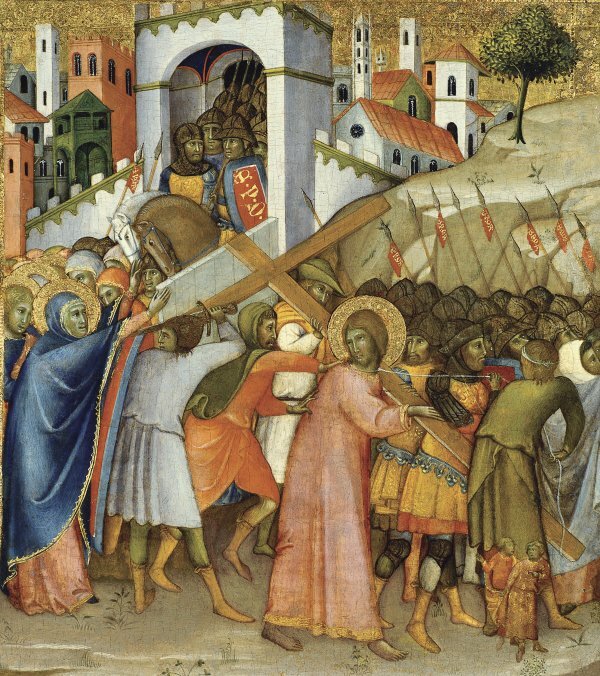 Christ on the Route to Calvary is one of the episodes from a predella on the Passion and Resurrection of Christ. In 1961 Gertrude Coor-Achenbach proposed a reconstruction of the predella from this altarpiece, which had been dismantled at an unknown date. In addition to the present panel, she suggested The Crucifixionin the Metropolitan Museum to be the central panel, accompanied by The Lamentation in the Nationalmuseum in Stockholm and The Resurrection in the Walters Art Gallery. In 1977 Federico Zeri suggested the final predella panel to be The Betrayal of Judas, which was on the Paris art market in 1972. Given the dimensions of the five panels that made up the lower part of the altarpiece, it has been suggested that the ensemble as a whole would have been intended for the high altar of an as yet unidentified church. With regard to a possible reconstruction of the section above the predella, Boskovits proposed two panels that were on the Italian art market: a Saint Louis of Toulouse and a Saint John the Baptist, to be located on the left of an unidentified central panel, and Saint John the Evangelist and Saint Francison the right. For the present panel Andrea di Bartolo was inspired by a painting by Simone Martini on the same subject of 1335 (Musée du Louvre, Paris). Comparing the two images, the parallels between the organisation of the planes and the overall conception are obvious. These similarities also include specific elements such as the arrangement of the central group of Christ, Simon the Cirene, the soldier with his sword unsheathed, the Virgin and the figure of Saint John. One of the most expressive elements in Simone Martini’s panel, the Magdalen with her arms raised, was omitted from the present panel and the artist preferred to insert the holy women within the crowd that follows Christ so that we can only see their faces. Di Bartolo repeated this formula in a scene in a polyptych in the Duomo in Tuscania and in a panel that was in the Ruffini collection in Rome. The present panel was previously attributed in catalogues of the Thyssen-Bornemisza collection to Bartolo di Fredi Cini, the father of Andrea di Bartolo. The current attribution was made in a text by Hans-Dietrich Gronau published in 1937. It was accepted by Bernard Berenson, Federico Zeri and Miklós Boskovits, among others.